Cooper Sound Systems' slogan, "Sonus Clarus" could just as accurately be "No Nonsense". Everything about the Cooper mixers has a purpose, and all of the functions of these mixers work together for a single purpose that can be boiled down to a single word: Professional. These mixers are designed and over built to stand the rigors of location production for people who rely on them to make their living as location sound engineers. I can attest to their success with this goal because I have used a CS-106 for the last 8 years on all types of location production, and the sizable investment has proven profitable. Cooper edifies the "form follows function" engineering creed. A novice who might gaze for hours in wonderment at a Mackie mixer would likely walk right past a Cooper, unimpressed. Audio quality, logical layout, simplicity, and specific function have always been the hallmarks of the Cooper mixers, which is very impressive to the professional. 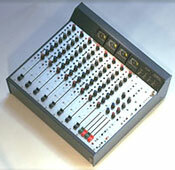 Still available is the mixer that made the Cooper company famous: The CS106+1, which was also once available in an otherwise identical 8-frame version called the CS108+1. The CS106+1 has 6 mic/line inputs while the CS108+1 had 8. The "+1" is for a blank module that can be left blank or fitted with either a 7th (or 9th) input module, a stereo mic/line input module, or an AUX module. While the CS-106 and CS-108 are basically 2 channel consoles, the AUX module provides two additional mix busses, effectively converting these consoles into 4 output mixers capable of tracking to the Nagra D or Deva 4 track recorders. Cooper uses a sturdy gauge anodized aluminum chassis and ultra precise fitting modular top panels to allow easy removal for servicing, reconfiguring, etc. Nagra standard Tuchel connectors for direct interface with mono and stereo Nagra recorders, complete with remote roll and automatic end-tones. Integrated talkback communications module for off-line, private, two-way communication between the Mixing Engineer and the assistant (typically the boom operator). DC power input (12 - 24 VDC) on a standard 4 pin XLR, and internal battery compartment that holds 12 D cells to power the mixer for, at minimum, a full production day. Cooper's brand new flagship, the CS-208, has a definite family resemblance to its older brothers. So much so that it includes every feature of the CS-106, but brings it up to date to meet the increasing demands of modern film production with increased outputs, more monitor options, and improved noise specs (-129.5dB), achieved while still using input transformers. After all of this, the CS-208 somehow still managed to reduce battery consumption. With the same unbeatable, rugged, precision, construction as the CS-106, the CS-208 has 4 main output busses, 4 meters, and 2 AUX sends, making it a top choice for the Nagra D and Deva digital recorders.